A CSA (Community Supported Agriculture) is a program in which members buy a "share" of the year's harvest before the season begins. This arrangement provides unique advantages for the grower and the consumer. The CSA model began in Europe by housewives looking for access to local, fresh vegetables and has expanded quickly in the United States over the past 25 years.The growers are assured a degree of certainty in marketing their produce, and consumers have a direct source for their fresh vegetable needs, all while contributing to the local economy and sound land management principles. At Anderson Organics, we have three options available for 2017 shares. 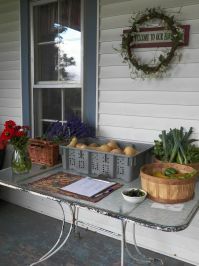 Our 12 Week Summer Season CSA Share runs from June 6 through the end of August. We are also offering an 8 week Fall Share for the month of October and a 4 week Winter Storage Share for the month of November! Members purchase a share at the beginning of the season and receive a box of produce each week for 12 weeks. A share box of produce contains 8-12 varieties of vegetables, depending on what is in season. Each share is roughly equivalent to 1-2 grocery sacks of vegetables and will furnish a family of four for the week. 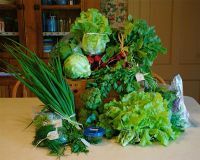 The beginning of the season will focus on leafy greens and herbs, and as the season progresses, the boxes will get heavier as fruiting crops and root vegetables begin to ripen. Please visit our "Buy a 2017 Season Share" link under "Join our CSA" to purchase a share of the upcoming harvest!